provides a sensory feast for visitors. Everything will be coming up roses – and a host of other blooms – in the Eastern Cape this spring with a line-up of spectacular flower and garden shows. The floral feast blossoms with the well-known Addo Rose and Garden Show, which takes place on 9 and 10 October 2010. It will see the small town celebrating the flowering of the famed Sundays River Valley roses for the 28th consecutive year. 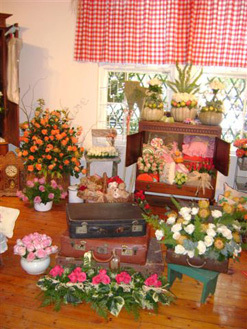 More than a quarter-century since the first show was held in the town’s historic Valentine Hall, the event – designed each year around a different theme – has developed into one of South Africa’s premier floral displays and an internationally respected drawcard, even being described by a former world president of the Federation of Rose Societies as “the best in the world”. This year’s theme is “Through the Garden Gate” and visitors can expect to be overwhelmed by the sights and scents of more than 20 000 roses of 40 different varieties as they pass through gates of different styles to reach displays reflecting formal, romantic, Karoo and English cottage gardens. Unlike in previous years, when the roses on display were almost exclusively grown in the valley, many of the blooms will be flown in from Johannesburg in a massive and finely planned logistical operation. According to organising committee chairperson Nita Tayler-Smith, there are not many commercial rose-growers left in the valley that was once as famous for these flowers as for its elephants and citrus fruit. She attributes this to rising production and marketing costs, which have eaten into growers’ profits over the years. A project of the Sundays River Women’s Institute, the Addo Rose and Garden Show has been held annually as a fundraiser for local charities since its inception in 1983, after an enthusiastically received suggestion from a member of holding a non-competitive show dedicated to “the love of the rose”. With up to 8 000 visitors flocking to previous shows, the institute is hoping the 2010 version will raise as much as R100 000 (US$14 387) to help local charities fight rural poverty. Projects that have benefited over the years include creches, libraries, community vegetable gardens, wheelchairs for the aged, and assistance to those living with HIV/Aids. With Addo being an easy drive of less than 45 minutes from Port Elizabeth on a newly upgraded road, the show makes for a perfect family day out. It will also offer music and other entertainment, crafts and plenty of good, old-fashioned country hospitality and farm fare – not least of which are the succulent strawberries and cream that rank just below the roses as the show’s top attraction. The rose show officially gets under way on Friday 8 October with the traditional preview dinner for ticket-holders, which this year takes the form of an elegant “Cabaret and Canapés” evening among the roses, giving guests an opportunity to view the displays at their leisure, without the crowds of the weekend. While some show visitors will simply soak up the beauty and fragrances of the vast rose displays, the fundis will be able to view 200 different rose species exhibited in a special “variety tent”, where local experts will be available to share information and answer questions. With favourable comparisons having been made with London’s famous Royal Chelsea Flower Show, the Addo Rose and Garden Show has previously attracted visitors from the Royal Horticultural Society of London, and closer to home, the South African Flower Union. Flower and garden clubs from around the country also visit the renowned event each year. Two weeks later, the Grahamstown Flower Festival will provide a weekend of horticultural, botanical and environmental interest and education in the Makana Botanical Gardens, the country’s second-oldest such establishment, at the foot of the historical Frontier town’s Gunfire Hill. In addition to enjoying the many plants, flowers, garden products, ornaments and furniture on display, visitors will be able to get their hands dirty at several workshops with intriguing themes such as “Handprints for Change”. The local Albany branch of the Botanical Society will host a sale of unusual indigenous plants, with the proceeds being used to support an outreach project to expose underprivileged pupils to biodiversity and provide opportunities for them to experience local flora and fauna. The funds raised will also be used to support the society’s hack programme to remove alien plants in the region. Prize specimens of a flower competition will be on display, while the gardens of the winners and runners-up in the Gardens of Grahamstown competition – which includes a township gardens section – will be open to the public over the weekend. In addition, some of historic Grahamstown’s elegant homes will be on show, also in support of charity. Vibey musical entertainment over the weekend will be provided by pipe, marimba and jazz bands from local schools. High-profile guest speakers at the festival will be Tanya Visser, editor of The Gardener magazine and presenter of the TV show of the same name, and popular London-based Irish garden designer and TV personality Diarmuid Gavin. Visser will discuss “Good gardening practices to make you a better gardener: recycling, water saving, worms, veggies and much more mulch”, while Gavin will share his experiences of creating gardens at six Chelsea Flower Shows. Rounding off the trio of Eastern Cape shows this month is the Bedford Garden Festival, taking place from 29 to 31 October in the charming British Settler village nestled at the foot of the Kaga Mountain. Just a few years old and already one of the Eastern Cape’s most popular rural lifestyle experiences, which draws visitors from near and far, the festival offers a range of gardens to visit on self-drive itineraries. The selection includes vast, park-like expanses on farms, as well as village and township gardens. Plenty of plants will be on sale, and visitors are advised to keep an eye out for Bedford’s famous scarecrows which pop up all over the place in fun examples of the villagers’ creativity and sense of humour. An outing to Bedford takes one through beautiful Eastern Cape landscapes of golden grasslands, indigenous bush and dramatic mountains. And in a village famous for its hospitality, festival visitors are assured of a warm welcome and delicious country fare. Twitchers will have a field day – literally – as local wildlife expert and registered guide Mark Whitehead leads three birding trips over the festival weekend. Birdlife in the area is abundant and the local bird list stands at 257 species. A craft market will be held under the trees in the grounds of a charming local church, which itself will be filled with roses to provide an added attraction. So if picturesque villages, flowers and gardens, browsing and buying, talks and teas, delicious and decadent food, inspired country creativity and warm-hearted rural entrepreneurs are your thing, the Eastern Cape’s famous floral festivals are not to be missed.